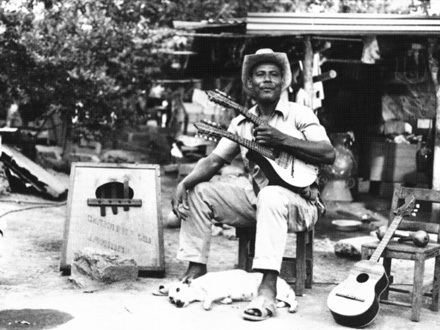 Cruz Quinal, "the mandolin king," lives near Cumana in a mountain valley surrounded by sugarcane fields. Perpetuating 16th century Spanish traditions of guitar-making, Cruz fashions such musical instruments as cuatros, marimba, escarpandola, and his own creation, a mandolin with two fretboards. He is an accomplished musician as well. In this moving portrait, Cruz compares himself to a decaying colonial church across the street: revered yet neglected, the village altar stands, paint peeling, under the open sky.